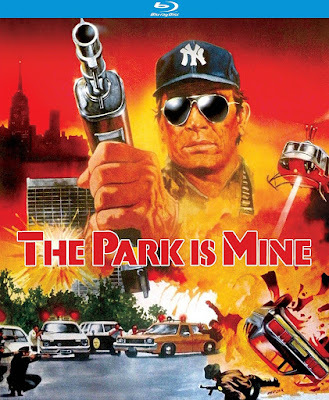 Rupert Pupkin Speaks: Kino Lorber Studio Classics - THE PARK IS MINE and THE NEPTUNE FACTOR on Blu-ray ""
As a kid I remember distinctly running from back yard to back yard in my best friend's neighborhood as we yelled "Wolverines!" while trying to poorly recreate scenes from RED DAWN (which we had just watched). That film really captured our imaginations at the time. There's something very RED DAWN about this movie that I can't quite quantify. I guess it's just the idea of a guy sneaking around at night in military attire, setting traps and explosives and basically fighting his own personal war. That's not exactly what he's doing, and the result feels more like THE TAKING OF PELHAM 123 because of the New York City and Central Park locales. The film actually comes down somewhere between PELHAM and FIRST BLOOD. It's not as good as either of those, but it is nonetheless quite engaging due in no small part to Tommy Lee Jones' central performance. 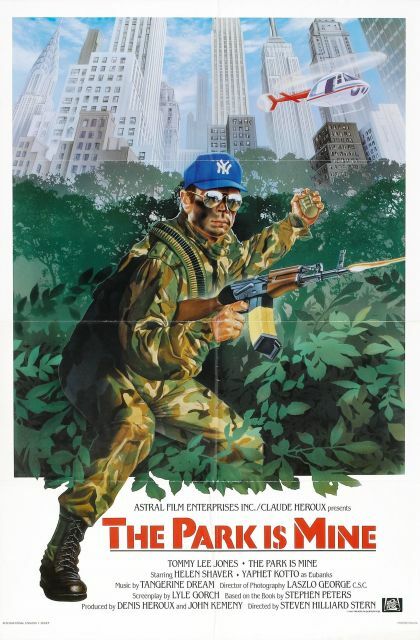 Jones plays a Vietnam veteran who takes over the elaborate plan set forth by one of his soldier buddies to booby trap Central Park with explosives and more or less shut the whole place down. Apparently the source material for this movie is a heck of a lot darker than what's portrayed here and there is a great deal of effort made to show the main character as sympathetic and not psychopathic. Certainly casting Tommy Lee Jones as your lead helps immensely in making the character seem less crazy and more trying to deliver a message (which is ultimately what his takeover of Central Park is all about). So you've got one of those standoff/negotiating scenarios between Tommy Lee and the cops (led by the great Yaphet Kotto) that you've seen before, but the message-y nature of this tale gives it a slightly different slant than you're used to seeing. Jones is decked out in camouflage and face paint, brandishing an AK-47 among other weapons (his buddy has culled together a veritable arsenal as part of his big plan), so that's fun and the whole show is scored by Tangerine Dream. If you're a fan of Tangerine Dream, you know that their dreamy, fantastical music can really elevate just about any movie they are involved with. THIEF, THREE O'CLOCK HIGH, SORCERER, THE KEEP and RISKY BUSINESS are just a few of the movies they've made better through the use of their unique musical stylings. This movie already has a cool premise, but the Tangerine Dream takes it up a notch for me (as is almost always the case) and I couldn't be more pleased to have their stuff playing in the background. This movie apparently premiered on HBO, so it looks like it has mostly been presented in a 4x3 aspect ratio over the years (though it may have been shown widescreen more recently). This disc features a 1.78 to 1 transfer so everything obviously feels more cinematic that way. Considering how the film has never been incredibly high profile, it's nice to see it get this kind of Blu-ray special edition treatment so that fans of Tommy Lee Jones, Yaphet Kotto and others can enjoy it once again. This is an interesting one in that it will have some appeal for fans of the Bert I. Gordon school of giant animal attack done with somewhat cheesy effects, but the cast is more like that of a 70s disaster flick. Headlining this demonstratively Canadian production (listen to the accents of most of the non-major stars) are Ernest Borgnine, Ben Gazarra, Yvette Mimieux and Walter Pidgeon. So the movie has the long setup of a disaster movie, but takes a left turn into fantastic territory later on. The character establishment and plot layout in films like this can often prove to be rather dull, and THE NEPTUNE FACTOR is no exception in that regard. The story here focuses on an undersea lab that is shaken by an earthquake and may have been thrown into a nearby fissure that can't be searched by a large conventional submarine. Thus, the submersible Neptune is called in to do a more in-depth (pun intended) search for the remains of the lab and potential survivors. Borgnine is of course right at home in this kind of disaster scenario, but Gazarra is a bit less so. His acting style is much more subtle. He uses facial expressions and his eyes in a way much more effective in the Cassavetes universe - here, he just seems perpetually annoyed. Don't get me wrong, I love to watch him in anything - he just seems less comfortable here. The film's director, Daniel Petrie, made a couple of my favorite 70s character dramas like BUSTER AND BILLIE and LIFEGUARD - but he seems a bit out of his depth here (second pun intended) and as a result, a lot of this plays a little flat. 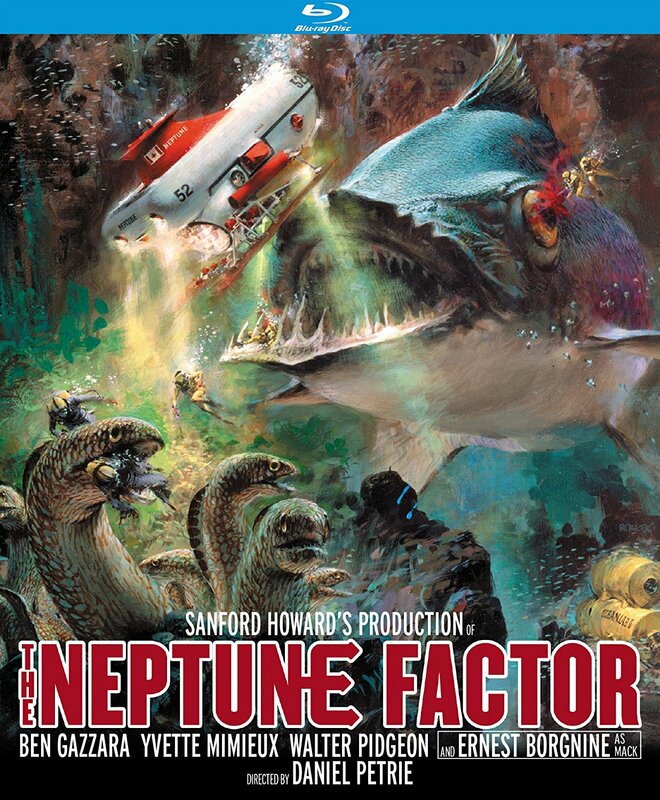 That said, the disaster movie fan and the giant monster movie fan in me both found something to latch onto with THE NEPTUNE FACTOR. Though the giant fish don't show up until about 71 minutes into the film's 98-minute running time and the submersible that is the Neptune often looks like a toy model from the outside, there is an off charm to it all that I can't rightly explain. The diving gear they use reminds me of old G.I. Joe cartoons I used to watch as a kid. It may just be me, but I ended up liking it. The transfer here looks good and I do always love to see older and almost forgotten films get this kind of nice treatment (and not get cropped from 2.35 to 1.78 as movies often do for HD TV broadcast). THE NEPTUNE FACTOR left me wishing that Gazzara and Borgnine had worked together more - preferably in a western context.